It’s an original adaptation of Dickens’ classic story about the second chance that comes with love and generosity. This production has become, to me and many others, what director Michael Wilson calls “a holiday tradition for families in Connecticut and beyond.” It’s witty and deep. It’s ghoulish and sweet. It takes the revered Victorian tale, timeless in its own right, and infuses it with macabre imagery and contemporary humor that resonates with audience members of all ages. If I say it’s the best thing to come out of Hartford since the first coin operated pay phone ringy-dinged at a local bank in 1888, you might think I’m exaggerating. On the other hand, you might look around and shruggingly acknowledge that I have a case here. Whatever your stance on the vitality of our strange city, the fact remains that A Christmas Carol offers one of the most popular reasons to come to Hartford during the holiday season. The play artfully elicits a mix of laughter, fright, tears and joy that keeps audience members returning year after year. This is the twelfth season of the Hartford Stage’s ghost story of Christmas; hopefully there will be many more. The first time I saw the play three years ago, I was accompanied by my husband. The next year, we took his parents. This time around we brought my brother and his girlfriend. I won't stop until all my loved ones have seen it, and even then I'll continue to drag my husband along. The sooner you check it out for yourself, the sooner you can claim your own stake in one of Hartford’s most uplifting holiday traditions. For more information, or to buy tickets, go to www.hartfordstage.org or call 860-527-5151. Dec. 15 & 16, 7:30 p.m.
Dec. 19 & 20, 2 p.m. and 7:30 p.m.
Dec. 22 & 23, 7:30 p.m.
Dec. 26 & 27, 2 p.m. and 7:30 p.m.
Dec. 29 & 30, 2 p.m. and 7:30 p.m. 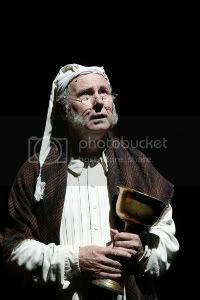 Image Credit: Bill Raymond as Ebenezer Scrooge. ; photo by T. Charles Erickson. 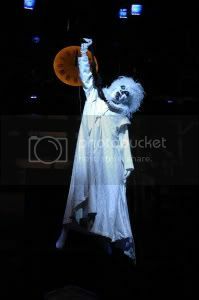 Image Credit: Noose Ghost; photo by John Groo.